Take this super fun cake for example – the four-tier cake would be real showstopper at your wedding. No one expects a wedding cake with rainbow stripes and fruit slice candy. I love this cake for a couple of reasons. First, I like that the all-white tiers are a slightly different height than the rainbow tiers. And second, I love the candied fruit slices. They’re just fun and whimsical. (And I could eat a whole bag of them if given the opportunity). You could probably make this a DIY cake project, but who has time for that? 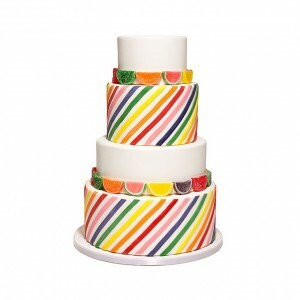 Just tell your baker that you want fondant rainbow stripes and candy fruit slices on your cake. You’ll be less stressed in the long run. You can find this bright and cheery wedding cake here.